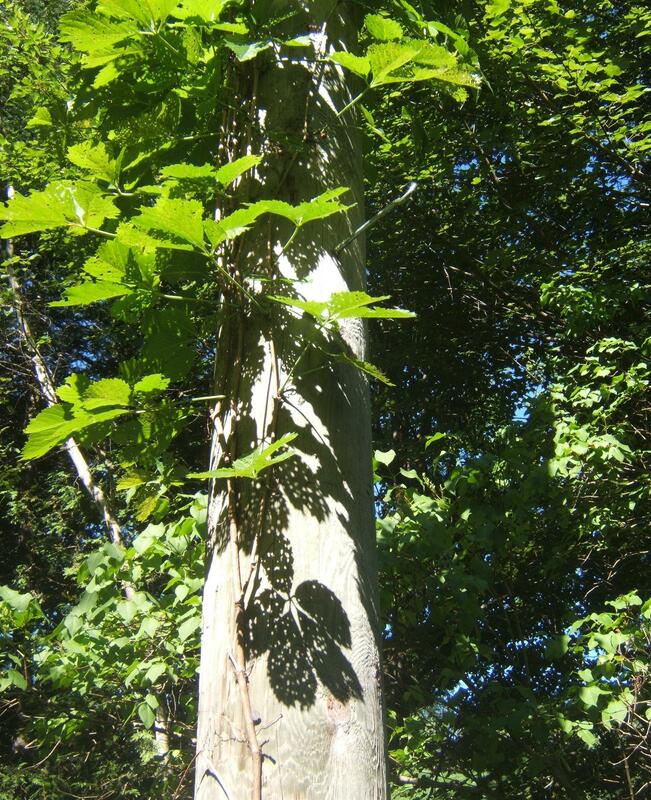 The power pole in front of our house is habitat for a vine of Virginia Creeper (Parthenocissus quinquefolia (L.) Planch.). also known as Woodbine. I brought the vine home about thirty years ago, as a slip collected from a plant in the park beside the St. John River. Over the years, it has struggle against the winds, determined to blow it from its perch, the power company, unhappy with its use of the pole, and the lawn mower as it snips away at the horizontal tendrils. This year, it has a new challenge to overcome. An insect has chewed the vine full of holes… probably not a severe problem for the plant. On Friday, I caught the shadow pattern created by the bug-eaten leaves as the sun shone at the right angle for a moment… a new way to see the consequence of belonging to the food chain! A beach-comber this time of year may easily over-look plants of Samphire (Salicornia europaea L.), also called Glasswort, Pigeon-foot, and Chicken-claws. Unless it is plentiful, it becomes lost ‘in the green’ of other sea-shore plants. The genus name, Salicornia, comes from the words sal meaning salt and cornu meaning horn. These plants consist of a branched, succulent stem, apparently without leaves or flowers. The leaves and tiny flowers are embedded in the stem. 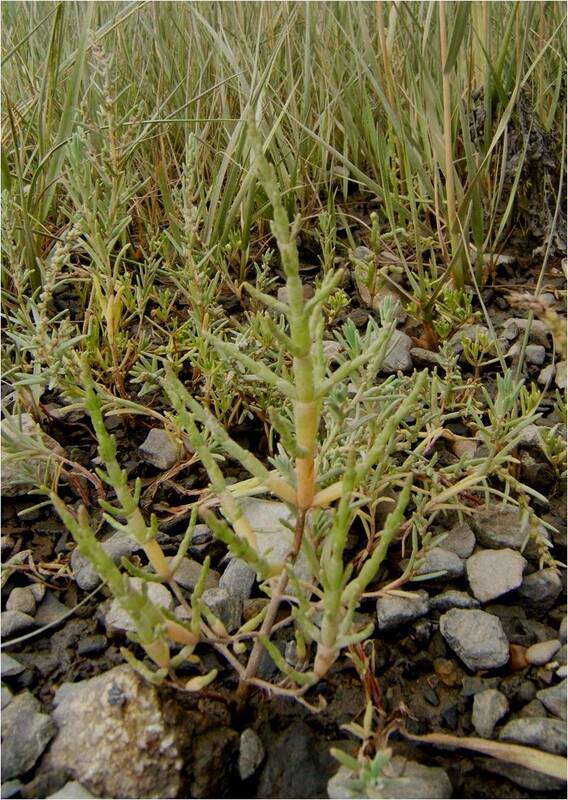 Although Salicornia is typically a plant of coastal areas, like Sea-blite, it is also found far from the coast, in the vicinity of inland salt springs. Samphire greens are salty, delicious as a salad ingredient, a pickle, or a pot-herb. Last month, whenever I went to get the mail, I was waylaid by a little plant sprawling next to the row of boxes. He was so charming, once I forgot to get my mail because I was examining his flowers and leaves! There should be a sign saying ‘No Loitering’. The plant was Silvery Cinquefoil (Potentilla argentea L.). As its name suggests, Silvery Cinquefoil is covered with fine silver hairs, giving it a downy appearance. It has fine-toothed, five-fingered leaves, palmately compound, and five-petalled yellow flowers. I have always liked the various species of Potentilla, interesting for the variety of their leaves. You can see how diverse these shapes are in a page from Roland and Smth’s Flora of Nova Scotia. 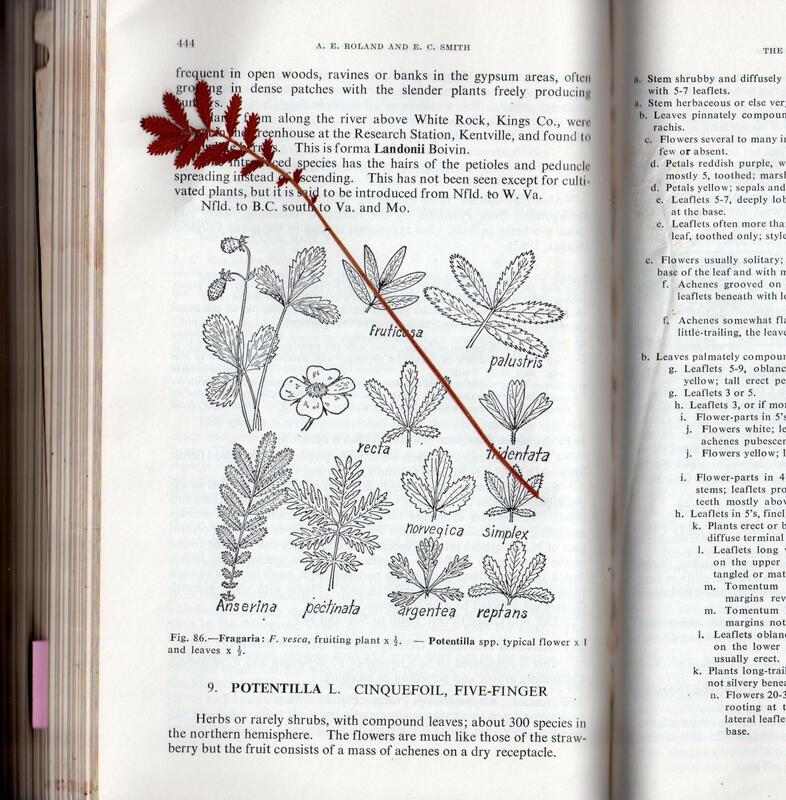 The reddish pressed leaf in the scanned book, for example, is Silverweed (Potentilla Anserina L.). My post for July 13, 2012, ‘coastal barren, coastal bog’, shows the Three-toothed Cinquefoil (Potentilla tridentata Ait.) https://nichepoetryandprose.wordpress.com/2012/07/13/coastal-barren-coastal-bog/ . 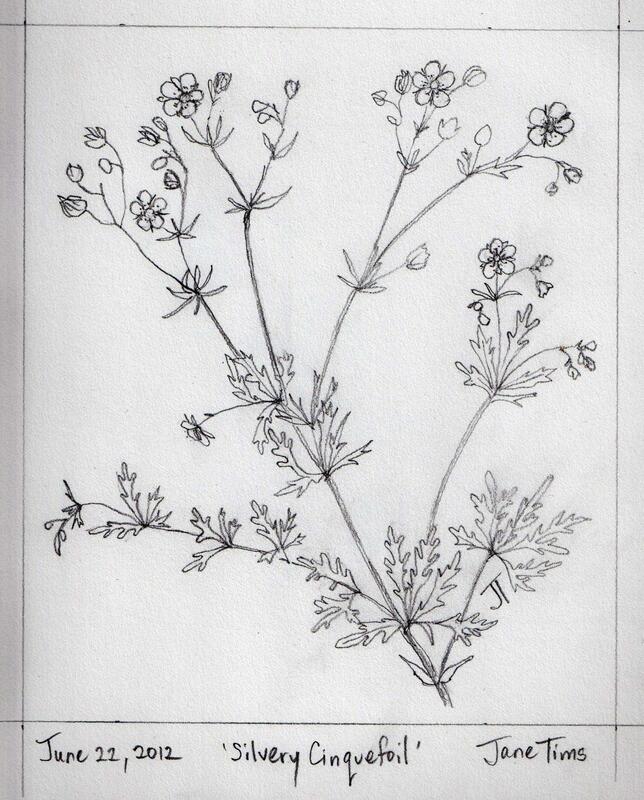 various leaf shapes of Potentilla in a page of The Flora of Nova Scotia (A.E. Roland and E.C. Smith, Nova Scotia Museum, Halifax, 1969) … the pressed leaf is from Potentilla Anserina or Silverweed, a coastal species of Potentilla. Our summer property is a constant source of learning for me. Every year I seem to find at least one new plant. 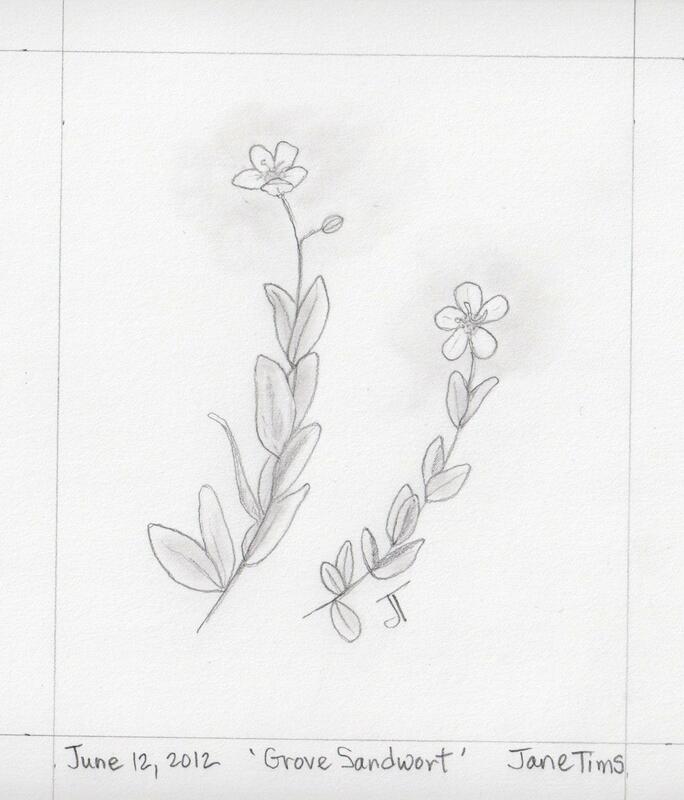 This year the plant is Grove-sandwort (Arenaria lateriflora L.). 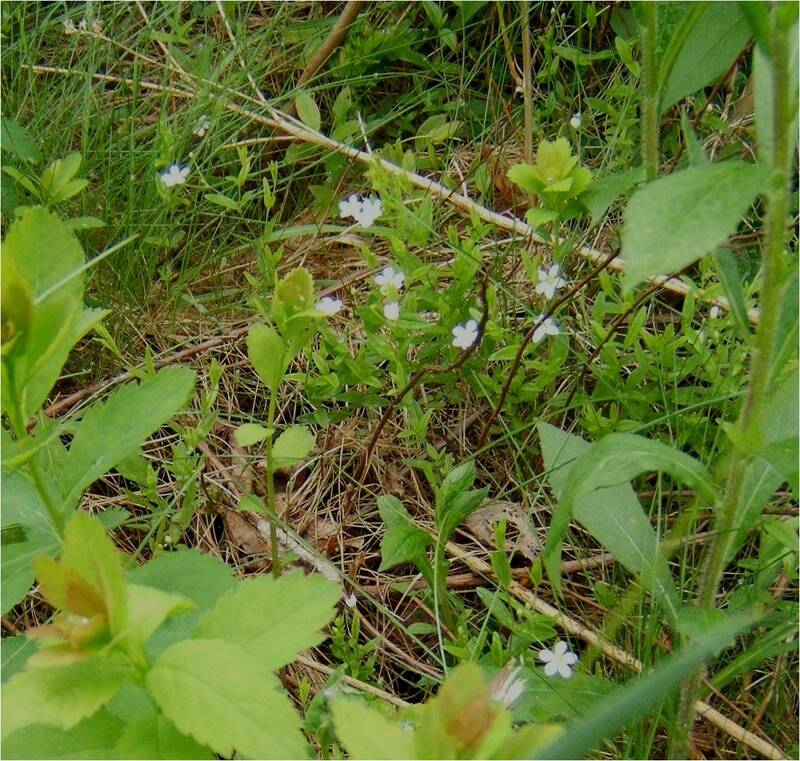 Grove-sandwort is a common plant, found in meadows, along shorelines and at the borders of woods. It is a low-growing herb, first noticeable in June. The starry, white flowers each have five petals and grow near the top and along the sides of a simple stem. The leaves are elongated, elliptical, and in pairs. Arenaria comes from the Latin arena meaning ‘sand’, where many of the members of the genus grow. The specific name lateriflora means ‘flowering on the side’. Have you learned to identify any new plants this summer? 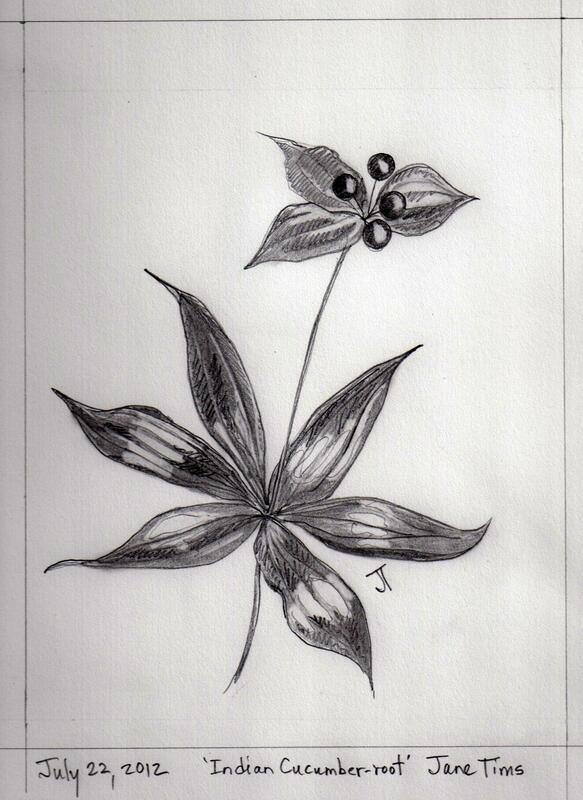 Some of the poems in my collection will address the ethics of eating wild plants as food. As a botanist, I know how many wild plants are edible. However, I also know there are ethical considerations to eating wild plants. Plants differ greatly in their availability. Eating Dandelion greens puts no pressure on the survival of the Dandelion. Weedy species in general respond well to being harvested, by putting out copious seeds, by filling in the spaces with new rhizomes and shoots, and by growing in many habitats and conditions. However some plants are very specific in their requirements. They need certain conditions of light, moisture and soil to thrive and reproduce. On our own property, I have watched the Painted Trillium (Trillium undulatum Willd.) struggle to maintain its presence. The Painted Trillium needs acidic, rich soils and lots of shade. 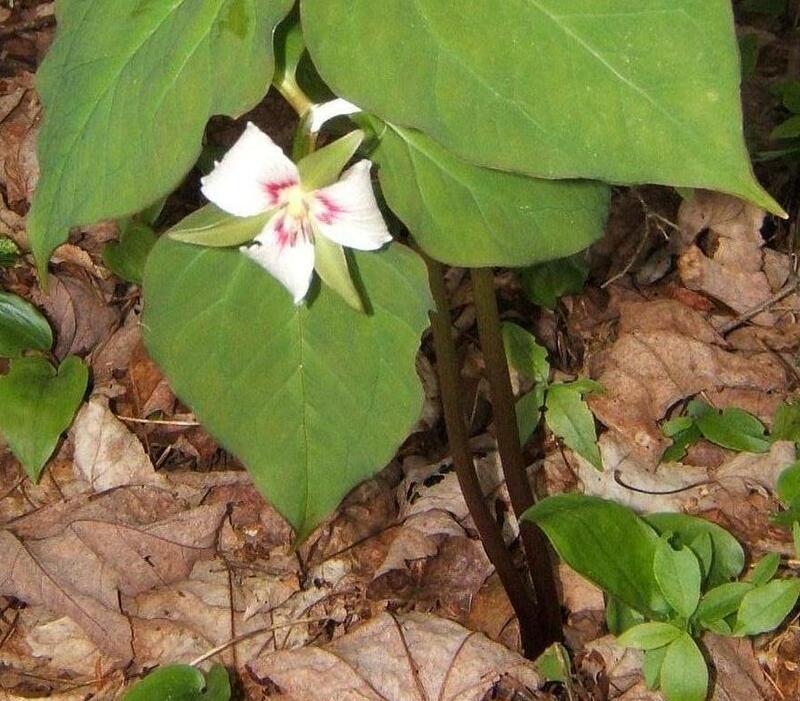 Remove a single tree, cut a new trail, or let the Balsam Fir overtake the understory, and the place where a few Trilliums grew in previous years is suddenly vacant. The young leaves of the Painted Trillium can be used as a pot herb, but should I pick them to add to my knowledge about eating local foods? In some circumstances, harvesting and eating these rarer wildflowers would be acceptable. In the past, for example, people of the First Nations depended on wild plants for their existence. A lost hiker, needing sustenance or hope in an emergency situation, could be excused for eating any edible wild plant. In other circumstances, rarity, the size of the population, and habitat health are probably the fundamental issues. Take the time to know a little about the plant you are thinking of picking. Is its habitat under stress or becoming hard to find? Is it rare, threatened or endangered? Local abundance may not be a deciding factor, since rare plants often grow abundantly where they are able to grow. Eating local is an environmentally responsible life-style choice. It saves energy and supports local farmers. Eating local wild plants as food is a nutritious and thrifty way to supplement the larder. But these benefits must be weighed against the possible harm to plant populations. Pick with some rules in mind. Understand the plant you harvest. Gather only what is sustainable. Sometimes this means gathering nothing at all. I took a break from writing this week, to take a drive to the Woodstock area, for lunch with my husband and to check out any antique stores we saw. We visited one store and I saw what I wanted the minute I walked in. 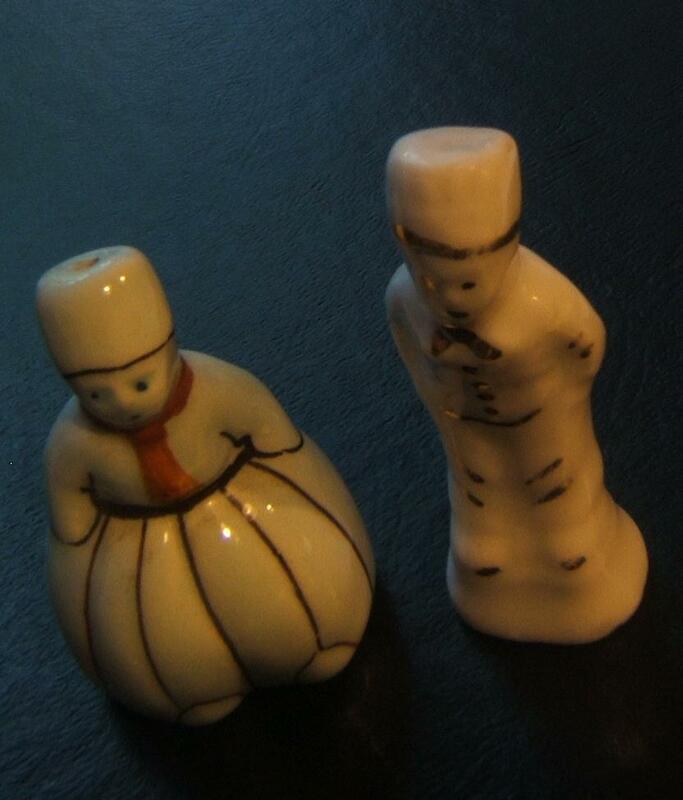 It was a little china salt and pepper shaker, a little Dutch boy, I think, from the bit of research I did on eBay. He looked familiar, so I paid a dollar (a dollar!) and he came home with me. 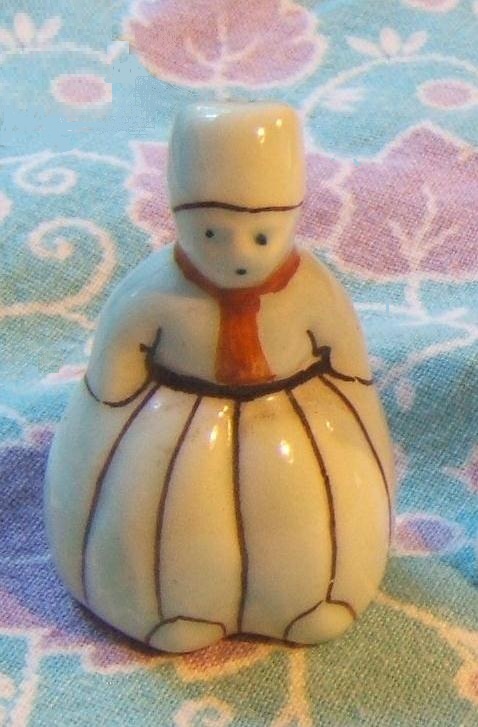 At home, I was so happy to find that he ‘matches’ another little Dutch figurine I have had for a long time. My figurine is not a salt and pepper shaker, but he is the same size and gloss. My son would say they belong to the same ‘universe’. It is so much fun to meet new friends. 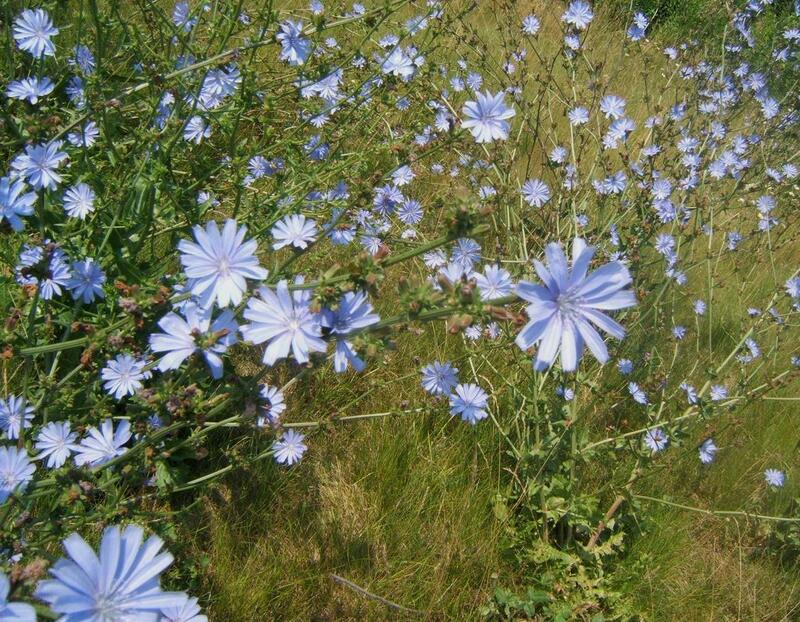 Along the Trans-Canada near Jemseg, one colony of Chicory has taken hold. Its bright sky-blue flowers catch the eye as the usual roadside vegetation rolls by. Also known as Blue Sailors and, in French, chicoreé, Chicory (Cichorium intybus L.) is a tall plant, found along roadsides and in other waste places. Chicory has basal leaves resembling those of the Dandelion. When broken, the stem exudes a white milky fluid. 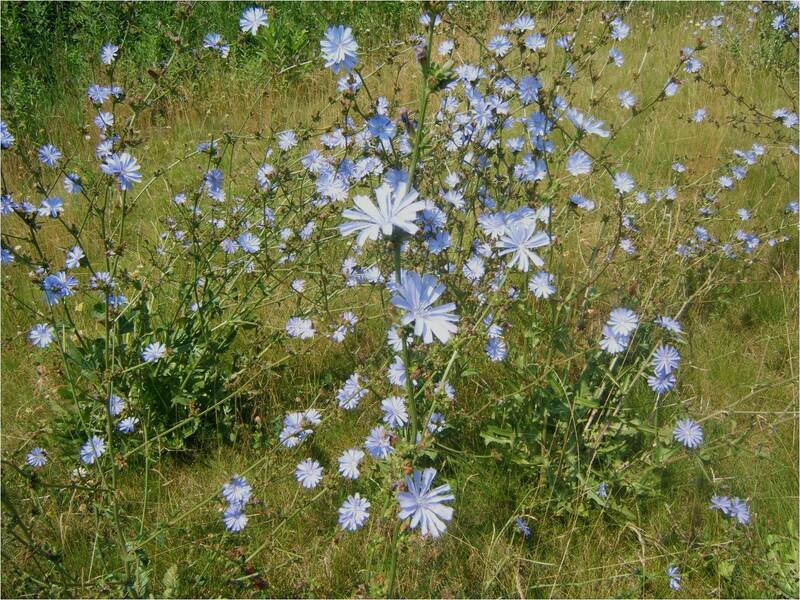 The bright blue flowers of Chicory occur along the length of the almost leafless and somewhat zig-zag stem. Each flower is formed of a central involucre of tiny blue flowers and a disc of larger ray flowers. The rays are square-cut and fringed. The flowers follow the sun, closing by noon, or on overcast days. Chicory is a useful plant. Its young leaves are edible as salad greens or as a pot-herb. The roots can be dried and ground to make a coffee substitute or supplement. The root of Chicory has soothing properties to balance the edginess caused by caffeine. The roots of Chicory are large and very deep. I tried to pull them by hand, but a shovel will be needed to harvest the roots in the compact soil of the roadside. When I see these flowers, I am reminded of my grandfather, my mother’s father. I never knew him, but I have a couple of photographs of him as a young man. I have made a small study of his mother, my great-grandmother, so I know quite a lot about him. The flowers of Chicory remind me of his eyes, since they were the same startling blue. He was also a tall man, another feature of the plant. The other name for Chicory, Blue Sailors, also reminds me of my grandfather. 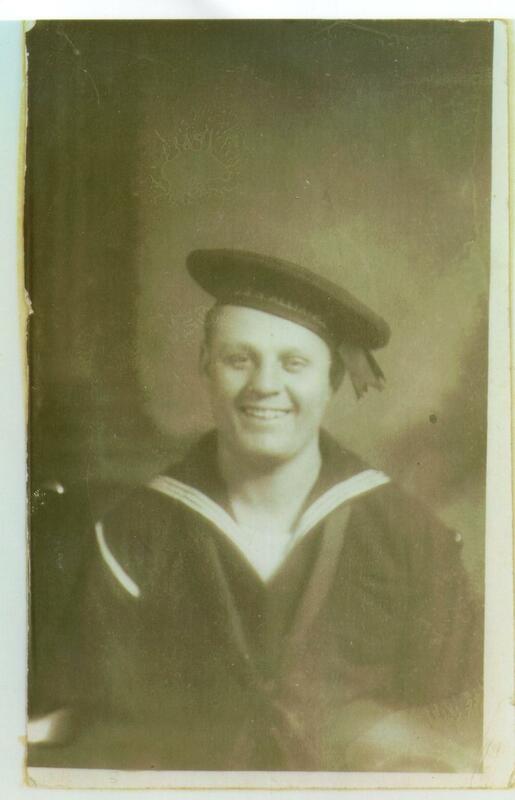 He was a sailor, entering the navy when he was only fifteen. I know from various records that he served on at least two naval vessels, the USS Nebraska and the USS Pensacola. 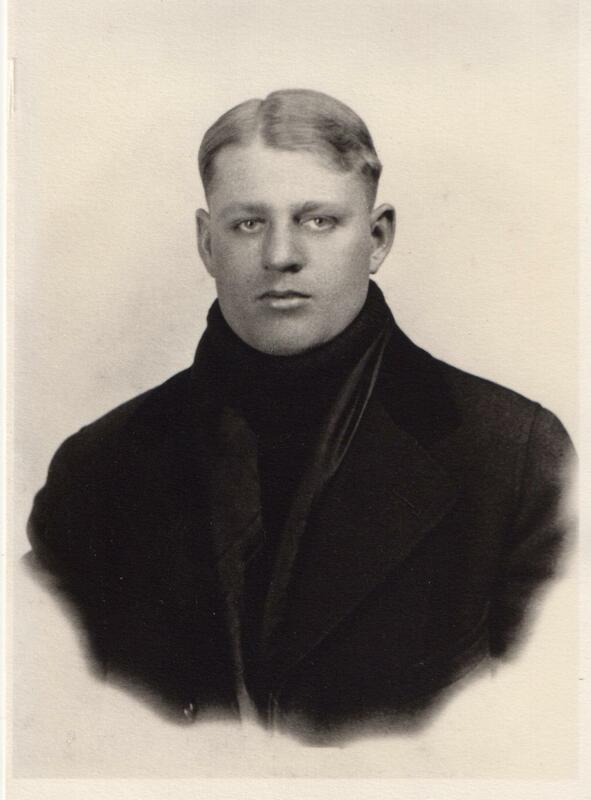 As so often happens when I see photographs of ancestors, there is a familiarity about his features.